I am a model railroader. I am also an M&M collector. My question is: I am making a model train layout featuring an M&M cityscape. 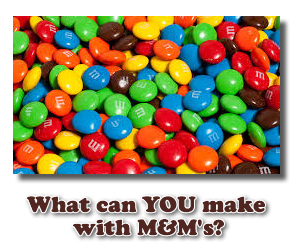 I would like to use all different sizes of M&M's for the streets, sidewalks, bushes, etc. What I need to know is if there is any type of spray or something that can be brushed on the candy after it is glued down to prevent the candy from melting? This train display would be shown at all different times of the year. Thanks for your help. Your question is very interesting and fascinating. I've never met an M&M Collector. :) I'm a an M&M eater! I don't think I could keep them around long enough to make something so clever as a model train layout with an M&M theme. I'd be nibbling on the scenery. I really don't know what would work to preserve the M&M's and keep them from melting. I don't really think melting, per se, would be a problem if they weren't being touched, unless you really had them in a very hot area or in the direct sun. I could be wrong, though. Let's see if anyone else has any good suggestions. I hope you'll take some photos of your finished railroad project and add them to the site. I'd love to see it, and I'm sure other visitors would, too! Don't do this. do not use real M & M's in your model train-scape. No matter what you spray it with (and believe me, that spraying will be an issue in itself!) the chocolate will eventually decompose from the inside, or - insects or molds will find a way to get to it somehow, even if you spray with acrylic you won't get every tiny micrometer of candy covered. Even if you DO get it completely covered, imagine an M & M, entombed in plastic, on a nice warm day.... imagine what that M & M will do. You will end up with a disgusting, smelly, ugly mess. Guys- don't try to memorialize real chocolate. Just don't. I am sitting here hoping to hear of this person's M & M catastrophe after one of their attempts.. I'd pay to see the result so I could mirthfully snicker with sardonic glee at their ridiculous attempts at making their cockamamie "M & M city-Scape". It doesn't sound like you will be eating the m&m's and that you are putting them on the display with some type of glue I take it?? If this is the case then you can get some type of clear coating/spray from the craft store that can be brushed or painted over the m&m's. I'm sure if you go to a local Michael's, AC Moore, Hobby Lobby they will be able to help you out with what product you should buy. Good Luck and I hope I was of some help. This sounds most interesting so I hope you will post some pictures..
Join in and write your own page! It's easy to do. How? Simply click here to return to Candy Game.